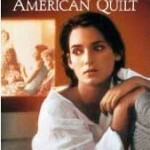 How to Make an American Quilt was shown in 1995 and stars Winona Ryder. This entry was posted in Movies to watch and tagged How To Make An American Quilt. tuesday couch potatoes, Winona Ryder on February 9, 2011 by Yami.